Perhaps you’ve been to weddings where the ceremony was typical and ordinary, maybe even Government issued. Conservative. Outdated. Boring. The “legal part” you just want to get over with, so everyone can get on with the party. For you, emotionally, the commitment and the marriage rites are potent and authentic. You want to make a meaningful public promise to this most amazing person you’ve chosen to marry, who means more to you than anyone else you’ve ever known. Tenderly tells your Love Story – Hand-Crafted and written just about you. “Jayne was absolutely amazing! She is competent,organized,reliable and professional. 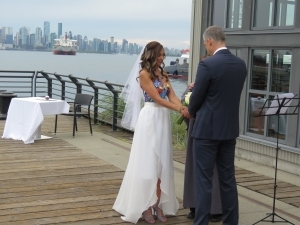 She helped us immensely to ensure that our ceremony reflected who we were as a couple. She really went out of her way to create a unique and memorable experience. Feedback from our guests was positive as well, they said they had never witnessed a ceremony like the one we had which included a picture puzzle and also involved our guests. Thank you so much Jayne! Exceptional value for the service you receive, well worth the fee.” ~ Carol U. You bring your vision – I’ll bring my expertise and guide you every step of the way. 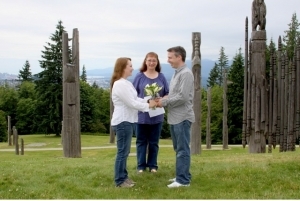 When you hire me, you can be assured that I will create a hand-crafted ceremony written just for you. From your answers to some very simple questions, and the dialogue between us, I will design and write your customized ceremony. 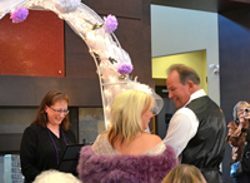 Your ceremony will stand out and be completely unique from anyone elses. You will always be offered a variety of choices and together we will decide which pieces we want to put into your customized ceremony. There are no two ceremonies alike because there is no one else like the two of you! Your ceremony will be a Celebration of how you arrived at your wedding day and, the hope and promise of what your new lives will be as a married couple. I will be there for you throughout the whole process and not just on the wedding day. 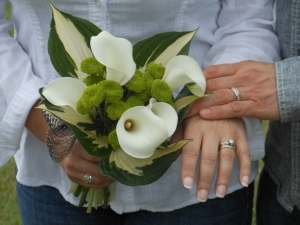 As a Professional Celebrant I take on the responsibility of keeping things on track. I will give you support and encouragement and be your rah-rah team as you accomplish the details for your day. I’ll set a reminder date for you to purchase your Marriage License, (about 2 months before your wedding). I will send a list of 2-3 places where you could purchase your license. I will also provide you with the information to take with you in order to make that process simple and easy. When you laugh together every day, just because. You like the way your souls feel when you are together. Walking together on this journey, no matter what life brings your way, is where your heart’s at. Although you know you might mess up sometimes, you will always try to cherish one another. When you absolutely know that you are better together than apart, then you know you need a Customized Wedding Ceremony, unique and reflective of you. No matter how well the plans and ideas are made there are always blips along the way. 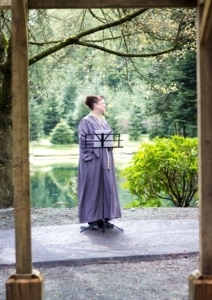 Little things need to change or a brilliant idea absolutely needs to be incorporated into your ceremony. Between now and your wedding day I will be in touch and available so we can add those fine details. I don’t just show up 2 weeks before the date! We’ll talk about who might make the announcement about cell phones and being mindful about photographers. Whether you want a blessing or not, perhaps what music you have chosen and how the table for signing and chairs will arrive at the venue. 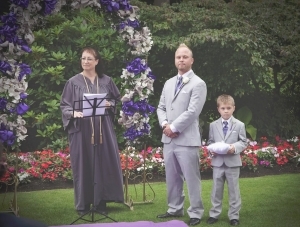 Sometimes the timing of the ceremony has to change to correspond with your venue. You might only have 2 or maybe 3 hours for set-up, ceremony, and tear down. Our open dialogue during the planning stages ensures that we are all on the same page and we will safely get in and out of your venue on-time. I can offer you support, suggestions and ideas, every step of the way. Are you feeling nervous? A rehearsal is the very best way to alleviate those nerves. Rehearsals help to solidify the plans and iron out any last minute pieces that couldn’t be anticipated. 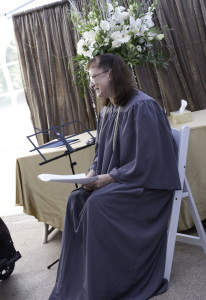 It’s my responsibility (and pleasure), as your celebrant, to facilitate your rehearsal. This is when the Order of Service becomes important. I send that to you, your photographer and any other professionals involved in your special day. This information is shared with all those who have a role to play in your ceremony so they know exactly what to do and when, to ensure a flawless performance. We’ll cover linking arms and the Position-of-Honour. Walking down the aisle with your Dad, the position of: guest’s chairs; wedding party; you as a couple. We’ll talk about the how’s and why’s to achieve the best Photo Opportunities. Your pictures and/or video will dazzle! Our on-going dialogue, suggestions and ideas have now paid off. It’s you Wedding Day! We have practiced, we’ve made our choices and finalized our decisions. We’re ready. Dedicated to ensuring that everything is done to perfection, you can trust that I always check and double check that the set-up is exactly the way you envisioned it to be, the PA system is working and, there’s a pen on the signing table. I’ll be there 30 – 45 minutes ahead, and offer any care and assistance that I can provide. (I have been known to help the groom with his tie, pin on boutonnieres, occupy the Flower Girl and tidy up the site for photos). I will always work to ensure that all your guests are assembled and the ceremony starts and ends on time. We’ll do it together! 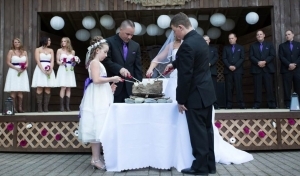 This ceremony is ideal for weddings with 40 guests or less. If you’re planning a wedding with more than this many guests, let’s have a consultation and talk about it. 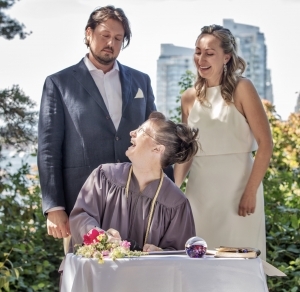 Weddings with more than 40 guests are $50 extra because you will want them to be planned and organized more formally – for both your rehearsal and your ceremony. Add a little, add a lot! Customize your ceremony so much that years later, your friends are still referring to it as “The Wedding”. Additional charges apply to customizations – contact me for a complimentary consultation and I’ll be happy to supply you with a detailed quote. Your ceremony is the most important part of your Wedding Day. When you arrive at the altar you are still single people. It’s not until you make your Vow/Pledge to one another, exchange rings and are pronounced, that you are actually legally married. You deserve a special ceremony where you can make memories that will last a lifetime – for less than ½ the cost of the average wedding dress. Our Ceremony was perfect for us as a couple! 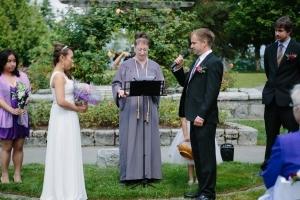 “We chose Dr. Jayne Gibson as our officiant as she was accommodating to the type of ceremony we wanted. She was very professional, well organized and had a great idea for a ceremony within a ceremony that was perfect for us as a couple! She really personalized the ceremony and made us feel very relaxed, adding in some humour about how we met. An added bonus was the Certificate of Marriage and copy of our ceremony she gave us, what an awesome keepsake! 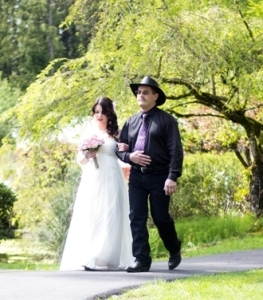 My husband and I highly recommend Dr. Jayne Gibson!” ~ Susan M.
This is how we truly personalize your special day. It’s an extra part that we add into your wedding ceremony where you can symbolize your relationship in a unique way. For example, you may want to have a Ceremony that your children or your pets share in, to symbolize the “union” of the family coming together on your wedding day. One couple built a campfire and had their children light the fire (we used candles) with them at the end. Candle-Lighting ceremonies can symbolize the elders of the family passing their soul’s flame through the family to the newlyweds. One out-of-town Grandmother was thrilled to be able to participate when she lit her candle over a Skype call. We can be totally creative when it comes to how you want to symbolize your relationship. What I will tell you is that, every time I have done this with a couple, the guests have been mesmerized.